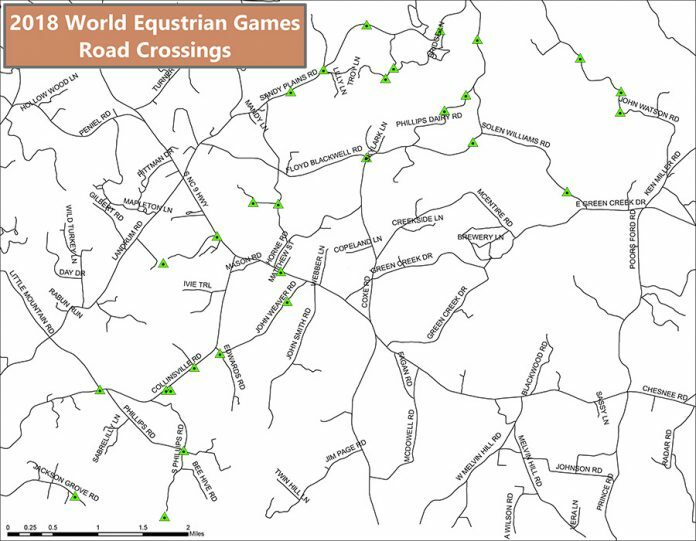 A number of Polk County roads will be periodically closed by the North Carolina Department of Transportation on Wednesday, Sept. 12 during the endurance competition at the World Equestrian Games. The 100-mile event will begin at 7 a.m. on the 12th, with competitors riding a trail that encompasses a number of private properties throughout the area. Riders will need, at times, to cross public roadways, necessitating the temporary closures by the NCDOT. Road closures will occur only on the 12th beginning at 6 a.m. and last until 8 p.m. Drivers in the area should expect delays throughout the day on the roads involved in the crossings. Roads will be closed as competitors need to use the crossing. Riders in the event will begin and end their 100-mile competition at the Tryon International Equestrian Center in Mill Spring. Polk County Local Government is offering a text messaging system for alerts throughout the Games. Those interested can sign up for those text message alerts by texting WEG2018 to 888777. The alerts will be available during the entire Games, which run Sept. 11-23. Sandy Plains Road-1 82° 3’43.39″W 35°15’45.82″N Crossing Road to use enterance of Over Mtn. View. Collinsville Rd./Hickory Grove Rd. 82° 6’14.16″W 35°12’36.34″N Cross Road at intersection, stay east of Hickory Grove Rd. Stirrup Downs Lane 82° 5’32.18″W 35°13’50.84″N Enter end of Stirrup Downs Lane, stay on gravel road 0.75 miles to NC Hwy 9 crossing. Stirrup Downs Lane/NC Hwy 9 82° 4’54.88″W 35°14’7.50″N Cross NC Hwy 9. Meadow Crest Road-1 82° 2’59.28″W 35°15’41.90″N Turns on Meadow Crest Road at intersection, follows shoulder 0.14 miles.